New York Rangers President and General Manager Glen Sather announced today that the club has agreed to terms with unrestricted free agent forward Mike Rupp. Rupp, 31, is a former Stanley Cup Champion with the New Jersey Devils in 2003, having notched one goal and two assists in the Cup-clinching 3-0 victory in Game 7 against Anaheim. The eight-year NHL veteran has surpassed 100 hits in each of the last five seasons. Rupp appeared in 81 games with the Pittsburgh Penguins last season, registering nine goals and eight assists for 17 points, along with 124 penalty minutes. He established a career-high in assists, and tied his career-high for games played. 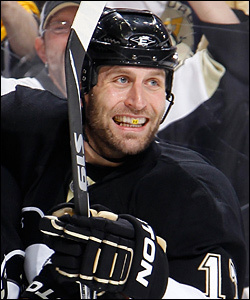 Rupp ranked third on the team and second among Pittsburgh forwards with 181 hits, and finished second in penalty minutes and fighting majors (12). In addition, Rupp recorded two points (one goal, one assist) and four penalty minutes, and led Pittsburgh with a plus-four rating in seven playoff contests. Mike Rupp is a former first-round draft pick who has played some of his best hockey at MSG, where he notched his first NHL hat trick on Nov. 30, 2009. The 6-5, 230-pounder has skated in 497 career NHL games with New Jersey, Phoenix, Columbus, and Pittsburgh, registering 49 goals and 40 assists for 89 points, along with 656 penalty minutes. In 2009-10, Rupp established career-highs in goals (13), points (19), shots on goal (87), plus/minus rating (plus-five), and hits (198) with Pittsburgh. He notched his first career hat trick on November 30, 2009 against the Rangers at Madison Square Garden, and appeared in his 400th career NHL contest on March 6, 2010 vs. Dallas. Rupp notched two goals while skating in his NHL debut with New Jersey on January 13, 2003 vs. Florida. In post-season competition, Rupp has appeared in 43 contests with New Jersey and Pittsburgh, registering two goals and six assists for eight points, along with 35 penalty minutes and a plus-eight rating. As a rookie in 2003, he helped lead New Jersey to the Stanley Cup Championship, tallying three points (one goal, two assists) in the Devils’ 3-0 Game 7 victory over Anaheim. He established playoff career-highs with three assists and four points in four games that year. The Cleveland, Ohio native was originally the New York Islanders’ first round choice, ninth overall, in the 1998 NHL Entry Draft. He re-entered the draft in 2000, and was selected by New Jersey in the third round (76th overall).